Knowing how to bet on MMA fights is the first thing, but where to bet is a bit of a conundrum. Inside the U.S. it is illegal to bet on MMA online outside of Nevada albeit one of the most popular things to currently do as MMA grows. Of course, millions of people bet at daily fantasy sports (DFS) sites usually starting on Friday and peaking Saturday. Below are the sites that are most bet on internationally and DFS in the US. As a former “big time” sports bettor, ahem not really, I’m going to answer your questions and explain to you how betting odds work and how to make money from MMA fighting. This is for traditional sportsbooks and does not cover betting on MMA at fantasy real money sites. Best Sportsbook for Betting MMA? Sportsinteraction.com – This has always been my favorite for Canadian players because they will always pay bets without too much delay time. Sports Interaction has a great selection of MMA lines and prop bets on all the fights, even the undercards. Their customer experience and cashier system are awesome. And I love their mobile betting, meaning I can place bets while watching the fights with friends. Draftkings.com – This is not a sportsbook per say, but we want to mention it because many of our customers find it a fun crossover from sports betting where you basically are parlay betting (picking more than one fighter) and betting on it that way. Unlike the common point spread on a football game where one team gets a certain amount of points (ex. Saints +7), in MMA fights the most common bet is primarily what’s called a Money Line, which is a single bet (a term most UK and European users use). 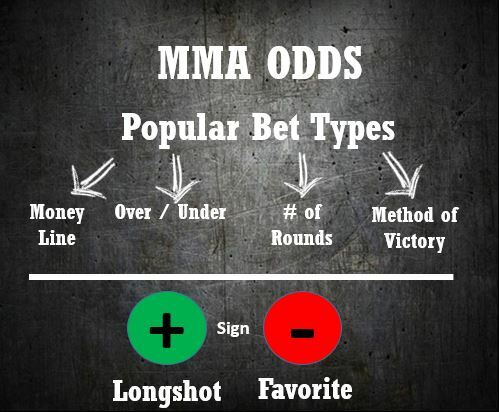 Prop bets, parlays (accumulators), over/under, round bets, method of victory and Inplay betting are also common MMA betting types. Odds are telling you how much you can win from a certain bet, not the “odds” of winning the fight. But by testing how much you could win with the given odds you can determine the “value” in a bet. So for example, you got a fight between an unbeaten fighter vs a regular, the odds for the favorite are going to be very low, meaning a $100 bet could payout $10. This might almost be a sure-bet, but there is no value as the possible profit is too small to take the risk. If you lose it could take a couple of winning bets just to recover, 10 to be exact with our example. The key is to find odds that pay an acceptable pot with a probable outcome that you have determined. So evaluating odds is very important, for favorite’s betting you want to at least to make 25% of your stake and underdogs should pay double or more. To find potential fights to bet use Sherdog’s Fight Finder Tool ( source 1). Unlike any other event calendar this tool can filter future or past events just typing in the fighter’s name, nickname or class weight. Let’s say we want to review the fighting history of Fedor Emelianenko. Search using just his name and you will see were his next fight will be. Following is a list with all his professional history. Note that he has won 34 fights and lost 4. Three of those 4 losses were by K.O. In this fight, GSP would be the favorite and at -245 odds it means that for every $2.45 you bet, you will win $1.00 if he wins the fight. If you bet $245 on GSP and he wins, you’d profit $100.00. If GSP were to lose though, you’d lose the full $245.00. 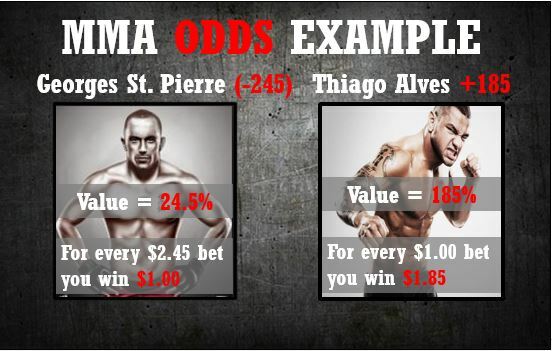 If you were to bet on Thiago Alves at +185, you would win $1.85 for every $1.00 you bet. So if you bet $100 on Thiago and he wins the fight, you will profit $185.00. Thiago Alves to Win value here is 185%. If Thiago were to lose the fight, you’d lose your original $100.00 bet. There are three main types of odds expressions used around the world, American Odds, Fractional Odds and Decimal Odds. A sportsbook will feature by default the one most used locally, were the sportsbook is from, but all odds expressions can be changed to whatever the bettor prefers just by changing the configuration. The ones expressed here are Vegas Odds or American Odds, the most used odd type in the United States for MMA and all American Sports. Why Do The Odds Change? Depending on how people are betting on the fights, the odds will shift from the moment they open up right until the night of the fight. Any fighter news might also change the lines. TIP: For strategy place your MMA bets live, after the initial bell rings. Hunt down odds above 40% for the favorite. Take for example what has been known as the greatest upset in UFC fighting, Matt Serra vs Georges St-Pierre 2007 ( source 2). Serra was a 32 year old nobody from Long Island who had won The Ultimate Fighter 4: The Comeback. A former gatekeeper who defeated one of the biggest stars with one single punch. Where to Bet on MMA Fights? Most local bookies won’t be taking bets on UFC fights – and if they are, they’ll job you with some ugly odds. The safest place to bet on MMA fights are reputable online sportsbooks or a real money fantasy betting site. There are great sportsbooks for Canadian players. They also happen to be the most legit operations and are run like Fortune 500 companies rather than shady bookie joints. Personally I bet at Sports Interaction (for traditional betting), Draftkings.com (for real money fantasy style betting). Most of these sites you can just deposit $50.00 and make a few bets for fun. Even having $10.00 on a fight adds a lot of excitement to your fight nights. If you want more info about betting on MMA fights, check out MMABetting.com, our sister site. We also have info on mma odds which have updated odds for every fight found on our homepage! It is always useful to double check if MMA fights are regulated in your country. In the United States for example the Association of Boxing Commissions oversees the MMA in almost all states. A couple other dozen countries in the world have their own regulations.